el gel, el vent, el fang. on la suor hi escriu, hi traça. d’abans no esclati el temps novell. Eduard Escoffet was born on May 29, 1979 in Barcelona, Spain. He is one of the most important Catalan poets of his generation. Escoffet works in the border zone of traditional and visual poetry, with sound poetry and performance. In the 1990s Escoffet emerged with his live experiments with poetry and music; till today the performance, not the book, is Escoffet preferred medium. He works with voices, computers and projections. Escoffet also works as a critic, an editor and as a cultural agitator. 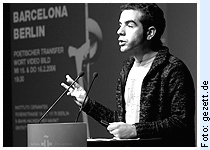 Furthermore, he organizes a number of events, f. e. the Festival Proposta (2000-2004) and Barcelona Poesia (Barcelona Inetrnational Poetry Festival) (2010 - 2012). He has published the poetry collections Gaire (2012) and El terra i el cel (2013), as well as the artist’s book Estramps with Evru (2011). Has published two records with the electronic music band Bradien, Pols (2012) and Escala (2015). Also curated with Eugeni Bonet the film series Coming Soon on This Screen: Letterist Cinema, between Discrepancy and Revolt at the MACBA, Barcelona (2005). He is co-author of the theatre plays ¡Wamba va! (with Gerard Altaió, Josep Pedrals and Martí Sales, 2005), Puaj./Ecs. (with G. Altaió and J. Pedrals, 2005) and La Belbel Underground (with Carles Hac Mor and G. Altaió, 2006).